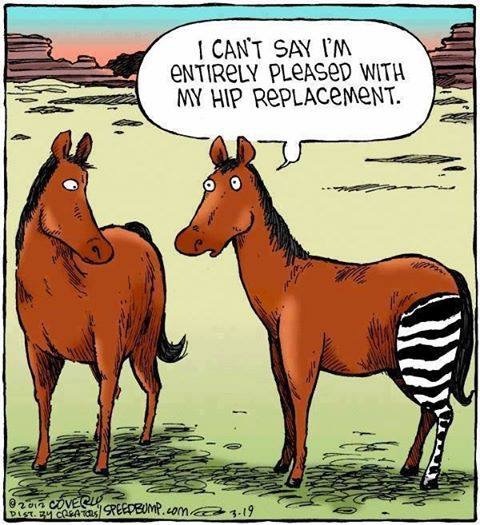 As I gear up for Hip Replacement #2, my sister sent this funny comic to me. I heard that something like a million joint replacements are now done in the U.S. every year. This also means that revision surgeries will start to rise rapidly as replacements wear out or are in need of replacement themselves. Thank G-d that they have these procedures to help people–I don’t know how people lived with the incessant pain and degenerative mobility even a generation ago. What’s it like to have a body part inserted to augment your own? While hearing aids amplify sounds and make them louder, they don’t resolve permanent damage to the inner ear. A cochlear implant bypasses the damage by receiving sounds in a microphone, digitizing them, and converting them to electrical impulses that are sent directly via implant to the auditory nerves– bypassing damaged or missing sensory cells in the ear–in a way that the brain can understand. I am in awe of the inventors–Graeme Clark, Ingeborg Hochmair, and Blake Wilson–who are being recognized for their pioneering research leading to the development of Cochlear Implants. We are living in a time of great miracles–thank you G-d! Creating a durable “soft, lightweight under[or over]suit that would help reduce injuries and fatigue and improve soldiers ability to efficiently perform their missions” is an smart and achievable goal, and one that would give us great advantage in the battlefield. I think the goal of having this be “potentially wearable by 90% of the U.S. Army population” is notable as not something that is for just special forces or unique missions, but rather something that can medically protect and make for a superior fighting force for all of our men and women. This is really only the beginning of human augmentation with sensors, storage, processors, and robotics to make our warriors fight with the best that both man and machine has to offer. It’s not a fight of man versus machine, but of man and machine. Seeing and hearing farther and with more clarity, connecting and communicating timely and under all conditions, processing loads of data into actionable information, fighting and performing mission with superior skills (strength, speed, dexterity, and endurance) and integrated weapon systems, guiding warriors to their targets and home safely–these are goals that man-machine augmentation can bring to reality. And of course, the sheer medical and rehabilitative benefits of these technologies in caring for the sick and disabled in society is enough to “pedal to metal” drive these efforts alone.